Marbled murrelets (Brachyramphus marmoratus), are small seabirds that nest in old-growth forests and feed in the Pacific Ocean. Murrelets need large areas of coastal and near coastal old-growth forest for nesting. They avoid fragmented and partially developed forest landscapes, and are declining rapidly in Washington and listed as a state endangered species. Unfortunately, the preferred alternative selected by the state Board of Natural Resources (BNR) falls short in protecting these imperiled seabirds and the habitat they need. The BNR alternative does not preserve enough older forest habitat for the rapidly and steadily declining murrelet population. The BNR alternative fails to incorporate the best available science for recovery of marbled murrelets that nest in older forests across western Washington. Marbled murrelets have declined by almost 30 percent since 1992. That’s steep. Despite federal public land protections, in Washington state murrelets’ old forest habitat has declined by more than 10 percent, notably on state and private lands. A murrelet sits on its nest in the crook of a large tree branch. In 1992, the U.S. Fish and Wildlife Service listed marbled murrelet as a threatened species in Washington, Oregon, and California in response to steep declines in the abundance and distribution of their old-growth habitat. Murrelets also face other threats: nest predation by crows and ravens, and reduced quantity and quality of the small forage fish that they prey on due to changing ocean conditions. 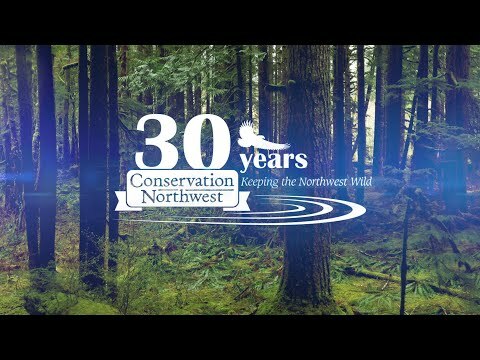 Conserving old forests protects murrelets and hundreds of other species of wildlife in Washington’s coastal areas. The Pacific Northwest’s old-growth forests help mitigate climate change by storing more carbon than most other forests in the world. We’re working with other conservation groups to ensure that murrelets, and their amazing old forest habitat, get the protections they need! The marbled murrelet is a small native seabird along the Pacific Northwest Coast from northern California to central Alaska, with a slender black bill and plumage that varies in color by season. Murrelets feed in the Pacific ocean and Salish Sea, sometimes venturing far from shore in search of herring, anchovies, smelt, sandlance, eels and other small forage fish. Unlike most other seabirds, marbled murrelets are solitary; they do not form dense colonies. Murrelets require old, mature forest habitat for their nests. They are known to travel up to 50 miles inland to a nest tree, selecting old-growth, craggy-topped conifers on which to lay their eggs. Murrelets lay a single egg on natural, moss-covered platforms where large branches join the tree trunks of old growth Douglas fir, Sitka spruce, western hemlock, and redwood trees. Learn more about marbled murrelets and threats facing them in this video from the U.S. Fish and Wildlife Service!